Real-time analysis with PROCON II. Up-to-date with PROCON II at all times. Manage your tunnel with business intelligence. Individual and tailored on your requirements. With the support of state-of-the-art data technology. With a solution from the Cloud. With PROCON II, the real-time data management system of Maidl Tunnelconsultants. PROCON II uses all advantages of cloud computing. Machine and monitoring data are acquired digitally and transferred to the cloud or to your local data warehouse in real-time. Upon request, MTC will also host your data so you can reduce your IT budget and maintenance effort. The highest security standards are guaranteed. PROCON II utilizes two decades of experience in mechanized tunneling. Our experience with more than 200 tunneling projects with various boundary conditions, machine types and driving teams is integrated within PROCON II. Actions, reactions and interactions are investigated using analytical algorithms in real-time. The foundation of this unaltered raw data combined with our scientifically recognized and practicable expert knowledge. PROCON II is based on the latest software technology. Thus, your vast process data are transformed into visual information. Take advantage of the affordable possibilities of geographical information systems (GIS) and link them to your interactive charts. With the generic chart and dashboard configurator, you can visualize all of the relevant information tailored to your specific needs and follow your project live with your web browser. PROCON II employs professional knowledge management. Re-invent the data analysis in your project! Simultaneous access to all the results of your analyses will enable you to make fast and fact-based decisions. You will benefit from process analyses that are tailored to your project. Using back analysis from successfully managed projects, you will even learn from past mistakes. PROCON II supplies the interface to online back office support. Maidl Tunnelconsultants supports you throughout the project and advises you on important technical and contractual decisions. We offer a complete solution - from tailored configuration to data hosting - from a single supplier. We either cover the complete project or merely troubleshoot in critical situations. Apply PROCON II in your project and optimize your process with respect to cost and time effort. Simple application of variance comparison. All PROCON II data sources (machine, shift, tool, process data, etc.) are combined in the dashboard. Individual, automated reports tailored on the customer for the documentation of the tunneling process. The analysis of downtimes and the influencing parameters in the dashboard optimizes downtimes. Insights to tool changes in the context of the existing ground parameters shortens intervention intervals. The monitoring is accessible from everywhere with the secured login. Customer tailored dashboards show required data precisely in context of the requirements. Data is linked via time, location and object, e.g. in a geographical information environment. All data from the PROCON II data warehouse can be visualized by means of interactive and customizable charts. 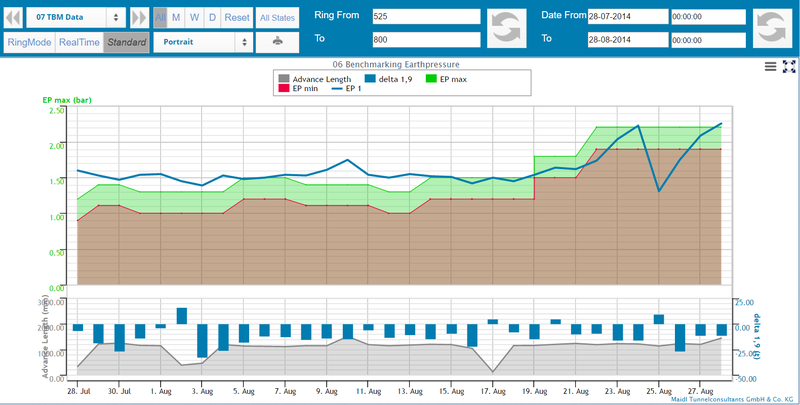 These charts can be directly zoomed, adjusted and arranged on specially developed dashboards in the browser. These dashboards gather information of specific topics and are used to display several sources of data in a common reference system for immediate comparability. In this context, your data is linked on dashboards with maps of a geographic information system as well as a digital ground models in a location or time reference system. Each chart is capable of displaying an arbitrary selection of machine data, target values, additional information and calculated values in a customizable visual appearance. For this purpose, line charts, column charts and area charts are available. For suitable data sources, also pie charts can be employed. All relevant project documents as CAD drawings, reports on existing infrastructure or buildings in the vicinity of the tunnel, geotechnical reports, ground parameters or images can be stored in the data warehouse and attached to the project-wide geometrical and temporal reference system. Using a geodetic information system (GIS) the relation of these metadata with the automatically acquired machine data and all further available project information is displayed on an interactive map of the tunnel and its environment. Project relevant documents and drawings can be visualized on different layers. To see the individual layers, click the "+" Button at the top right corner of the map to open the drop-down menu. For better orientation, the current position of the tunnel boring machine is marked in the map as well. Thus, all potential hazards, alert conditions, data and performance analyses and further visualizations can be directly referred to the respective location of the machine and the event. An optional geo-referred ground model can be stored in the PROCON II data warehouse as well. This model comprises not only the geometrical definition of geotechnical layers in the longitudinal section along the tunnel alignment but also the respective ground parameters like strength or abrasivity. Thus, the ground model serves as a reference for wear, consumption and performance analyses. The interactions of the TBM with the ground are continuously tracked by means of machine data analysis. Comparing target and actual values of the ground support, also settlements and the stability of the tunnel face can be monitored in real time. In an interactive visualization of the longitudinal section, the ground model can be further displayed along with arbitrary data visualization charts on a dashboard. For each advance parameter, target values or desired ranges can be defined. Additionally, analytical computations can be performed using the formula editor. This enables a target/actual comparison on all levels. In the presented example, the earth pressure development is shown in comparison to the target values of the support pressure calculation. In the bottom of the dashboard, the fluctuation of excavation volume in relation to the thrust jack extension is presented. In an integrated additional database, monitoring data is stored that is retrieved from arbitrary instruments registered in the PROCON II data warehouse. For each instrument the position, its assignment to a monitoring section and its assignment to a specific class of instrument (e.g. extensometers or leveling points) is captured. Using this information, the location and the time of measurement of each data entry is connected with the project reference system. This allows specific visualization options for monitoring data. The development of settlement troughs, for example, can by shown by visualizing monitoring cross-sections. Display of the settlement points in the interactive navigation map. Display of the currently measured value by clicking on the settlement point in the navigation map. Representation of the settlement curves in the longitudinal direction of the tunnel (the tunnel axis as well as left and right of the tunnel axis, as far as measuring points are installed). Comparison of the settlement curve with selected machine parameters. For an efficient and consistent process, mechanized tunneling requires constant surveillance. Therefore, PROCON II provides one or multiple so called Sensorboards which display the current values of a selected sample of sensors in graphical and intuitive manner. MTC provides a basic layout of the Sensorboards but it can be customized for each individual project. In addition to the "advance mode" which always presents the current data, a Sensorboard can also show historical data. In the "history mode" you can jump to a defined point in time, ring, or tunnelmeter to analyse the situation at the chosen moment. For an easy navigation in the time line Quick-Select buttons have been added. The advanced analysis is a category for more sophisticated dashboards that are accessible for selected users of the system. It is reserved for complex topics, or deeper analyses of certain processes. One key process of the advance is the excavation process. Specifically designed dashboards can visualize all key parameters to this topic for a deep investigation and evaluation of the excavation. The simultaneous storage and common referencing of target and actual values allows for automated alarming that is seamlessly integrated in PROCON II. Using the common location-and-time reference system, any violation of user-defined thresholds can be set to trigger an e-mail alarm to selected users. Furthermore, hazards can be displayed in the built-in map feature to assist with a quick location of potential problems. Using the alarming and messaging system, potential hazards can be communicated to the responsible persons in real time such that required counter measures can be initiated without delays. Many hazardous situations can be prevented or diminished by quick reactions. An interactive module for shift protocols extends the list of optional features of PROCON II. Extracting periods of advance, ring building and standstill automatically from the machine data, these time intervals are displayed using a Gantt chart visualization for each shift. Shift reporting represents an essential element of the documentation of a tunneling project. All actions are documented and can be evaluated as well as exported. In PROCON II, multiple types of shifts per day can be generated like a morning, day and late shift. The key processes like advance and ring build are automatically retrieved from the machine data and assigned to each shift. The reason for each downtime slot needs to be specified by the user. Here, the catalog of downtimes is specified according to each project's requirements. Based on the documented downtime reasons, evaluations can be performed based on which the process can be optimized. For detail evaluations, additional filters on specific shifts or staff members can be used, hence allowing for an assessment of reasons for performance differences among the shifts or to identify specific parameters that correlate with the performance. The integrative nature of the data warehouse and the unified temporal and spatial reference system helps identifying previously unknown interactions and hidden mechanisms in the process. Evaluate the downtime distribution and analyze the reasons for performance issues using different visualizations like pie charts or bar charts. In those charts, either specific codes can be captured or a whole group code. In this example, groups of codes are selected. The x-axis of the downtime bar charts can be selected as required. For example, the downtimes can be evaluated by ring, by day or by week. Combining this information, all processes in excavation can be analyzed regarding their time and cost structure. Here, all information stored in PROCON can be employed, like, e.g. geological information or machine data. The presented shift report is a customized report. It can be adapted specifically for your needs. In the report the individual downtimes are visualized in a Gantt chart and listed in a table underneath. Additionally, the main downtime reasons are provided. The management of cutter tools is very important especially when excavating in hard rock. The wear of the individual cutter tools must be documented to prevent the tunneling machine from being damaged due to worn-out tools. In PROCON II, the individual tools can be registered and maintained. 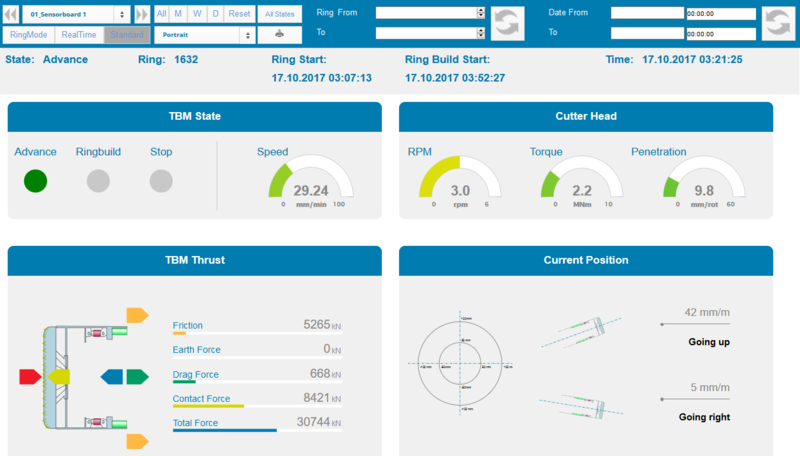 Data can be entered based on interventions which represents an event when the cutter tools are checked for their current wear and changed, if required. Types of cutting tools like disks, scrapers and buckets are distinguished in the system and can be managed in respective user interfaces. The entered intervention data can be displayed using Procon's chart and dashboard configurators. Here, the tool consumption can be correlated with machine data and geology information. Thus, evaluations can be performed of the required tools in context of the excavated ground. Following the identification of those wear mechanisms, the prediction of the tool service life can be improved and maintenance intervals can be optimized, reducing the risk of unplanned standstills. 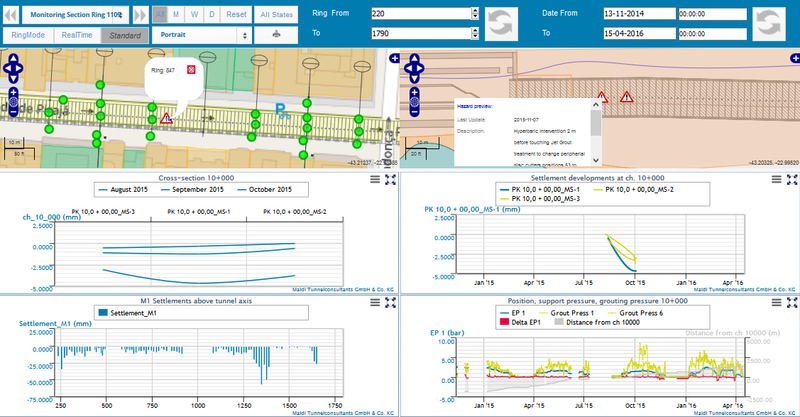 Correlating maintenance logs with the digital ground model, data mining and data analysis tools can be further employed to detect the influence of certain ground properties, types of tools and driving parameters on the tool wear. In this context, the number of changed tools of different cutter types can be combined in one chart, represented in different compressions like per ring, per day or per week. This data can be arranged on a dashboard along with data which influences the tool abrasion like the geology or the thrust force. Based on this assembling of data the advance can be evaluated and informed decisions can be made to improve the excavation process. The condition of the installed cutter tools is visually provided. The current wear of the installed tools is represented by different colors. Additionally, those tracks are highlighted on which a tool has been exchanged, refurnished or switched. The status of the tool condition can be presented for each intervention. Furthermore, by selecting a specific track the history of this track is provided in a table beneath the cutter image. The documentation of the tunneling process is essential due to many aspects. Therefore, PROCON II offers custom-designed machine data reports, intervention reports and shift protocols as printable reports to document the progress. Upon setup of the project, MTC considers the project-specific requirements and prepares automatically updating report templates via the web interface. Reporting periods and various filter functions can be arbitrarily selected. The reports can be arranged in dashboards to allow for adjustments of reporting periods and to add manual annotations before downloading and printing them. Special customized reports containing different, selected machine parameters are provided by MTC. They are filled with data for the selected range in the dashboard and offer a download functionality such that they can be printed and signed. As usual, these reports can be displayed on dashboards in the context of additional data visualizations, thus allowing for further in-place evaluations. For further specialized processing of the recorded TBM data, selected data can be exported in CSV format. The required data series can be easily selected and stored in a template for a quick reuse, so that for each download only the time range has to be specified. In many cases, you may want to add location-based and process-related additional information. These can be (ranges of) target values for operational parameters such as support pressures. But also external measurements and evaluations such as ground water levels, information on site logistics, or ground conditions can be easily acquired on a by-ring basis. PROCON II enables you to add these data in an arbitrary structure by means of user-defined processes and definition of respective process data types. These data can be arbitrarily visualized and combined with machine and monitoring data on Procon's dashboards.